Let's kick-off the weekend with a few fun finds from around the web, along with our new weekly feature, the Fine Pin! This Periodic Table of Typefaces, spotted on How About Orange, represents 100 of the most influential typefaces of our time. A print of the table would make a great gift or office accent for a graphic designer! Be sure to check out this interesting article from the Wall Street Journal on the appeal of paper and stationery to social media aficionados. Looking for a fun and simple weekend craft? This DIY bracelet from Sweet Paul will add style to your look in no time. With football season upon us, it's time to start jotting down a few great tailgating recipes for game day. Check out this great tailgating recipe collection via Martha Stewart. Speaking of tailgating, this week's Fine Pin is sure to excite fans on game day. Check out this neat (and clean!) presentation of a Seven Layer Dip. 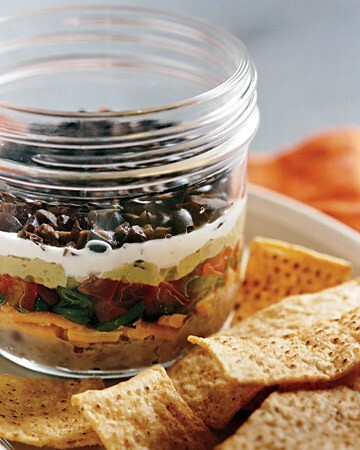 Simply prepare the dip in a larger jar and screw the top on for transporting it!